We're happy to announce that Toolbox v2.2 is now rolling out to Chrome and Firefox users (Opera should approve it soon). There are a few major changes in this update, including ones you probably wouldn't notice. 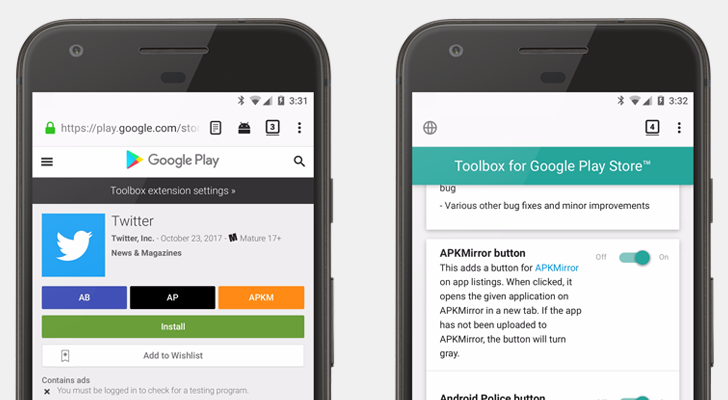 Back in March, Google began rolling out a brand new Play Store site. Even though it mostly looked the same, there were massive changes under the hood, which caused Toolbox to no longer work. It took a while, but the extension once again works perfectly! We've fixed several Firefox-specific bugs in this release. On Firefox for Android, you can now open the extension settings by tapping 'Toolbox' in the overflow menu. You can also open the settings from the Add-ons page. Finally, the beta program button now shows up on apps in pre-registration. This didn't work in the past due to a bug. If you already have Toolbox installed, you should get the update soon. It started to go out a few days ago for Chrome and Firefox, so some of you may already have it. At the time of writing, it's still waiting on approval for Opera, but that shouldn't take more than a day or two. Since Opera and Firefox reverted back to v1.1 after we released 2.1 (due to some changes Mozilla and Opera wanted us to make), this is the first time in months that v2.x has been available outside of Chrome. You can install it in your favorite browser using the links below. If you have any bug reports or feature requests, feel free to leave a comment!